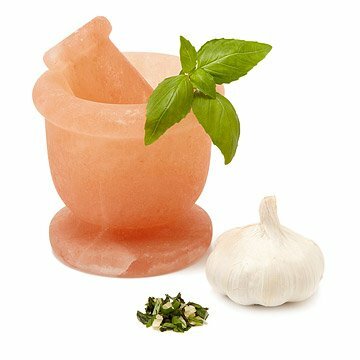 Add vibrant flavor to your food with this mortar and pestle made from Himalayan pink salt. Wake up your taste buds to high-definition flavor with fresh herbs, crushed in this extraordinary mortar and pestle, hand-carved from Himalayan crystal salt. Your favorite herbs are full of oils and flavor molecules that are diminished or destroyed when they are dehydrated. Crushing fresh leaves and stems, on the other hand, releases those flavors and scents for you to fully enjoy, and the salt itself helps to extract them from their cells in the plant. Himalayan salt is more durable than standard table salt, and with proper care it will last for many uses while still imparting a touch of flavor-enhancing saltiness to your herbs. Salt also has natural antibiotic properties, so cleaning your mortal and pestle is as easy as rinsing with water and allowing to dry. Made in Pakistan. Brett Cramer wasn't always the salty genius he is today. Until 2009, he was focused on entrepreneurship in the tech industry. But that year, he decided to make a special holiday gift for his friends. Combining his love of gourmet cooking and his enjoyment of woodworking, he created a wooden base from scrap lumber to hold a row of test tubes, which he filled with unique salts from around the world. The response from his friends was so positive that he realized he had hit upon something wonderful. He refined his design and grew his homemade gift idea into a business that now offers 180 different kinds of salt from 30 different countries. Do not place in a dishwasher or leave in standing water or the salt will erode away. Simply wipe clean and dry between each use. This was a present for my cousin's husband, who loves to cook. I was really excited for this. It just now arrived, and is broken. There was supposed o be bubble wrap around it, and it was not covering the entire thing, so a huge side of it had broken off. Very disappointed, as it is now too late to order another one for a Christmas present, and that was a lot of money wasted. Seems like a great product but very upset that it arrived broken. We grind most of our spices, anyway, and this makes it tastier and more fun. It's very pretty sitting on my counter, but does take up a lot of space. I picked up the box and it was extremely heavy. I opened it up and found out why. This is 6 inches high and 6 inches wide for the Mortar.. the pestle is 5 1/2 inches long.. Very large.. Rather comical looking in my kitchen. This was a gift for my dad and he was thrilled when he opened the box. It's a unique present and it will help make some delicious food! My brother considers himself the master of the kitchen and he was "Wowed" by this uniquely thoughtful gift. If you have "chef" in your life, this beautifully crafted postal and mortar is the perfect addition to their arsenal of culinary wonder! He couldn't stop raving about it! This is a beautiful mortar and pestle that I got for my mother. I had seen others that were okay, but just ordinary looking. So far she has loved it for crushing herbs for cooking.